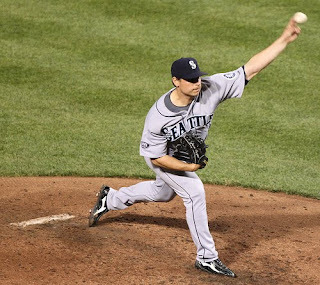 Jason Vargas started on the mound for the Mariners today and he started a little rough. After the first two batters, the M's were down 1 - 0 after a Michael Young RBI single. That remained the score for a while as Derek Holland pitched well enough to hold the Mariners to just one hit through 5 innings. Brendan Ryan led off the 6th inning with a leadoff double and moved to third base on a Figgins ground out. Alex Liddi came up and singled home Brendan Ryan to make the score 3 - 1. Yeah, 3 - 1. The Rangers got two runs on a big mistake to Michael Young. A pitch left out over the plate that left the ball in the right field bleachers. The Mariners played add on in the 7th as Kyle Seager lifted a homerun into the upper deck in right field. Seager has hit the ball well thus far and continues to do so. That was all for the M's in the 7th. Vargas was taken out in the bottom of the 7th with 2 outs and he had only thrown 95 pitches. Yorvit Torrealba was on second after a leadoff double and he was still there. Vargas was getting it done, but Wedge had it in his mind to bring in Erasmo Ramirez to face Ian Kinsler. Interesting decision to bring in the rookie in that situation, but I guess you have to throw them into the fire eventually. It was more of a position for Tom Wilhelmsen, but he did what he did. Ramirez gave up a double to Kinsler, scoring Torrealba and then a single to Michael Young that scored Kinsler. The moved proved to be costly as the Mariners went from being down by 1 to being down by 3. In the 9th inning Jesus Montero singled and scored on a Miguel Olivo double to make the score 5 - 3. The game could have been tied in the 9th, but, could have's don't ever get the win and our Mariners suffered the loss of the game and the loss of the series 3 - 1. I would say that the loss is due to a serious lack of hitting off of Derek Holland, but I could just as much attribute it to Erasmo Ramirez and his inability to get the third out in the 7th. Vargas will get the loss in the game which in my opinion is the worst stat that baseball has. Vargas could have got Kinsler. Vargas could have only given up 3 runs, but he was responsible for the runner on 2nd. That's the way the game goes sometimes, and this time the Mariners were on the losing end. The Texas Rangers are a better ball club with better pitching and way better hitting, but there is a lot to take from this series against the AL Champions. The Mariners have battled in each and every game. Well, besides the first game where they scored 5 runs in the first two innings and decided to stop hitting. In the last three we battled late, pitched well and held the Rangers at bay and stayed within reach. Well, game one ended up way out of reach but wasn't it great to cream Darvish in those first two innings? I wish we stayed in that game. Well, tomorrow is the day we've all been waiting for. The M's return home for their home opener versus the Oakland A's. Felix Hernandez will be on the mound and King's Court is already sold out. It will be quite the crowd as it was last reported that only about 1500 tickets remained for tomorrow's game. The Mariners have completed their long road trip at .500 which is a good place to be after a 4 game series with Texas. It could have been better, but it could have been way worse. Can't wait for the sea of yellow shirts tomorrow in the King's Court. Let's go King Felix!!! !